Digital innovation is being brought to bear in saving African rhinoceroses from being butchered by poachers. The potentially life-saving system has been developed by a team of researchers at Chester University. Using satellite tracking, video and audio recording, and heart rate monitor will enable rangers to keep a close watch on individual animals and trigger helicopter responses to combat threats to this endangered species. 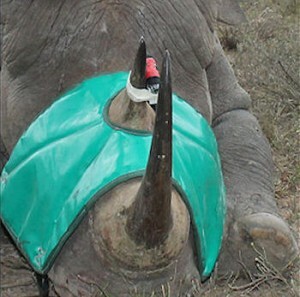 The system has been dubbed “horn cam” because the audiovisual system is embedded in one of the rhino’s horns. The official name of the system is Protect Rapid (Real-time Anti-Poaching Intelligence Device) and it is set to revolutionise the fight against poachers, not only for the protection of rhinos, but also other endangered species such as tigers and elephants as the technology is refined. Apart from the horn-mounted kit, there is also a GPS satellite tracking collar with a heart rate monitor. The South Africa trial is being overseen by Dr Paul O’Donoghue, the Chester University research leader. He is concerned that, despite armed patrols being deployed to protect rhinos, one animal is killed every six hours in Africa – and poaching is on the increase. “The issues are many, but there’s far too much money at stake to believe that legislation alone can make the difference. We had to find a way to protect these animals effectively in the field; the killing has to be stopped,” he said. Initially, the Rapid system may not save the lives of rhinos but it will eventually make poaching uneconomical by preventing the attackers from harvesting the valuable parts of the animals before the ranges arrive in their helicopter. The cameras will also assist the authorities in capturing the poachers and successfully prosecuting them in the courts. When monitoring sites become operational next year, the system will be triggered when a change in the heart rate of a rhino is detected. A quick visual check will ascertain the cause of this and a helicopter will be deployed to arrive at the site within minutes. 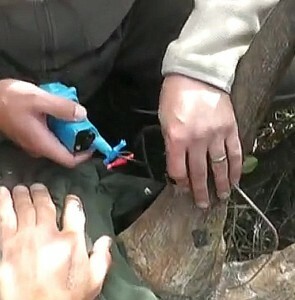 Mounting the camera is a harmless procedure of anaesthetising the rhino, drilling a hole through one of the horns to fit the camera inside, and attaching the transmitter to the camera. The efforts of the chest. The team is being aided by organisations such as Humane Society International, which is currently working with the Vietnam government to reduce demand for rhino horn through an education and outreach programme.